Weave is a complete patient communication system that helps to increase your staff's production on the phone, and provide an exceptional patient experience. Weave is a unique patient communication system that is known best for its ability to integrate its VOIP phone system with your dental practice management software. As a result of this powerful integration, your front desk staff can become more productive on the phone, and immediately pull up all relevant patient information through the system whenever a patient calls in. This saves your staff time, but it can also result in an impressive patient experience. This is all in addition to offering the capabilities that you can find in other patient communication systems. The downside to using Weave is that in order to leverage its phone system integration, you'll be forced to use VOIP phones provided by Weave. The risk with relying solely on VOIP phones is that if their phone system has any issues, or if your internet is unstable, you'll experience dropped calls, which can cause more headaches than it's worth. However, if you're able to overcome these hurdles, then you'll be rewarded with the most powerful patient communication capabilities that are offered by any system on the market. $100/month for reviews service add-on. Weave is a VC-backed tech startup that launched its patient communication system in early 2014. The company participated in the prestigious Y Combinator startup accelerator, and has since raised multiple rounds of funding. Their system is currently used by 3,000+ practices across the USA, with the majority of their customers being dental practices. However, there are also some optometry offices that use Weave. Below, we'll discuss some of the key features of Weave, and how they can benefit your dental practice. Weave is known best for its ability to integrate your phone with your practice management software, so that whenever a patient calls, you'll be able to immediately pull up the necessary information about the patient, and streamline the call process. In order to facilitate this integration, you'll need to use a Polycom VOIP system provided by Weave (with pre-installed software), for an additional charge. The system will not work with other phones. By integrating your phone and your practice management system, you'll be able to quickly pull up all relevant information whenever a patient calls your office. This will enable you to provide an exceptional patient experience. For example, when a patient calls, Weave will display the patient's name (based on their phone number), so that you won't have to ask who's calling. This may seem like a subtle benefit, but it can help make the patient feel important, and ultimately strengthen their relationship with your practice, and increase the patient's customer lifetime value. In addition, Weave will bring up any other relevant information, such as any upcoming appointments, overdue payments, or relevant information about their family members. Another powerful feature is that Weave is able to record your phone calls. Note that in certain states, this will require the patient's consent. By recording these calls, the team can periodically listen to various phone calls, and identify opportunities for improvement. For example, the team may find that they're not converting new patient phone calls as often as they would like. To understand why, they may listen to recorded phone calls from new patients, and see if there are ways to field those phone calls more effectively. Though Weave's ability to integrate your phone and PMS together is very powerful, you'll need a solid internet connection to make it worthwhile. If you decide to remove your phone services, and strictly use Weave's VOIP service, whenever your internet goes down, your practice's phones will also be down. However, Weave has a system in place where, if your internet goes down, you can login through your smartphone, and redirect phone calls from your practice's phone number to your personal number, so that you don't have to miss any calls. Weave's phone system also has a bit of a learning curve, which can cause some confusion initially, especially as you're onboarding with the system. However, once you're used to the system, you'll have access to the most powerful phone system on the market. Since Weave customers use Weave-provided phones that come pre-installed with software, the system is able to keep track of several metrics to help you measure how effective the team is on the phone. 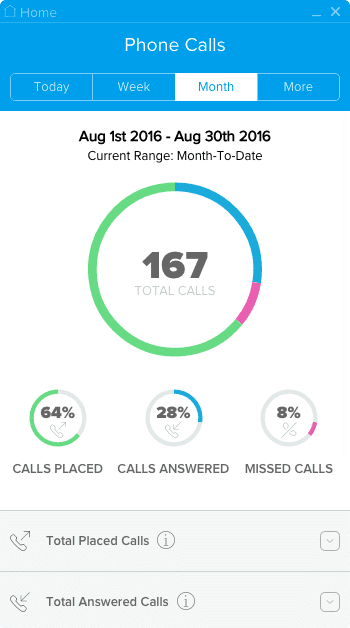 For example, you can see who has answered the most phone calls, who has placed the most phone calls, the number of missed calls, and how your call volume is distributed throughout the day. If you see that there are many missed calls, you can identify the time of the day these calls are occurring, so that you can make sure someone is always available at that time. Analyzing this data enables you to identify opportunities and make data-driven decisions to help improve your practice's performance. In addition, this data enables you to identify team members who are the most productive on the phone, so that you can acknowledge and reward them. As with other patient communication systems, Weave helps dental practices reduce cancellations and no-shows by sending automatic appointment reminders to patients. The reminders are fairly customizable, and you'll be able to create your own templates that let you specify the contents of each message, as well as the time each message gets sent out, and the medium (text or email). You don't need any programming knowledge in order to create these templates. Once a patient confirms their appointment, the appointment will automatically be confirmed in your practice management system as well. In addition to appointment reminders, you can also use Weave to send out recall reminders, which are just as customizable. Weave's two-way texting module enables you to send text messages to patients directly from your computer. When patients respond back to your message, Weave will alert you on your computer. Since text messages have higher engagement compared to other mediums, this module can be a powerful tool that helps increase patient engagement. In addition, since you're able to manage all of your messages through your computer, you can easily organize all of your conversations with patients, and manage multiple conversations simultaneously. 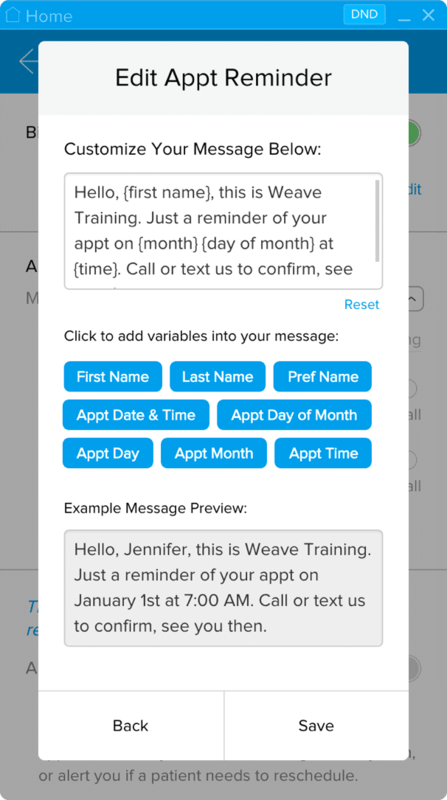 After a patient completes their appointment, Weave can send a text message to the patient asking them if they'd like to leave a review for your practice. These messages can either be sent automatically, or on a patient-by-patient basis. The text message that gets sent will include a link, which asks the patient if they enjoyed their experience or not. If the patient said that they enjoyed their experience, they will be directed to the site of your choosing (such as Facebook or Google), where they will be asked to leave their review, as well as any additional feedback that they would like to include. If, on the other hand, the patient says that they didn't enjoy their experience, they will be directed to a feedback form that can only be seen by your dental practice. This feedback won't be posted online, but it can help provide valuable feedback to your practice. Compared to other patient communication systems that help solicit reviews on a microsite (and generally aren't that valuable), Weave's patient reviews are more valuable, since they directly help you solicit reviews on highly regarded sites like Facebook and Google. Is Weave right for you? Weave is a complete patient communication system that offers a unique value proposition compared to many of its competitors. In addition to the typical functionality you'd expect from a patient communication system, Weave also offers a powerful phone system that integrates with your practice management software. This is a powerful tool that can help improve your front desk staff's productivity on the phone, and can also help provide the best possible patient experience. The downside to this phone integration is that you're dependent on using Weave's VOIP phone system -- any other phone will not be supported. This can be a hurdle for some, especially because relying solely on a VOIP system means that your phone's uptime is dependent on the stability of your internet connection, as well as the phone system. Some users report experiencing issues with dropped calls and outages, despite having a good internet connection. If your practice already has a substantial patient base, and receives many calls throughout the day, then Weave can be an exceptional investment -- after all, the more phone calls you have each day, the more important it is to streamline this process. However, you'll have to overcome the additional learning curve and hurdles of getting set up in order to enjoy these benefits, which may be a turn off for some. To learn more about Weave, you can visit their website here.